The main entrance of the restaurant is located in the Galerie du Roi. Set in the old Hart workshops, suppliers of the Royal Family and authors of the medal of the Belgian Constitution, this exquisite place has over 175 years of history of casting and striking medals, decorations, official ribbons and luxury stationery. 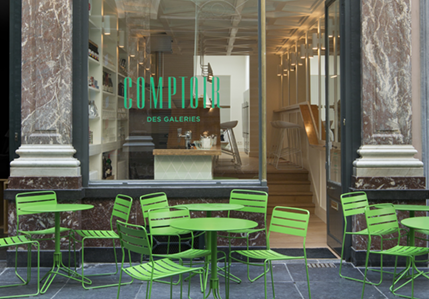 Le Comptoir des Galeries opens to a 60-seat restaurant, designed by the architect duo Fleur Delesalle and Camille Flammarion. They have created a bright, inviting and comfortable place, articulating into several rooms that enfold the planted patio. The open kitchen, wooden tables, ceramic-tiled counters and geometric paneled ceilings extending into mirrors make the identity of this unique restaurant. The impressive balance wheel and press material of the old workshops have remained intact and contribute to the restaurant’s setting and atmosphere.